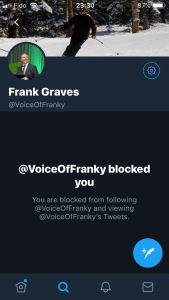 TheGunBlog.ca — Almost all Liberal Party of Canada voters are hostile to hunters and sport shooters in cities and support a “total ban” on their guns, Frank Graves, president of Ekos Research Associates, said in a Twitter post he deleted following this article. 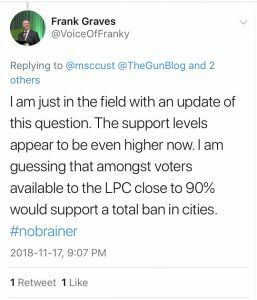 Graves’s “guess” about the poll result late on Nov. 17 suggests a Liberal re-election next year would force urban shooters to give up their firearms or move if they choose to comply with any new bans. Many say they will explore options. The government of Prime Minister Justin Trudeau is already examining new bans and penalties for lawful shooters as a tactic to win votes and strengthen its control of parliament. About 90 percent of possible Liberal voters support a “total ban” on urban gun owners, said Graves, himself a prohibitionist. That compares with 69 percent in a survey a year ago by Ottawa-based Ekos. Update 18 Nov., 10:58 Toronto time: The tweet, published at 9:07 p.m. Toronto time on Nov. 17 and pictured at the top of this article and below this paragraph, appears to have been deleted this morning. It was still available at 4 a.m. and now shows as “The Tweet is unavailable.” on mobile or “Sorry, that page doesn’t exist!” on desktop. Graves said in a second deleted tweet he “could not care less” about informing survey respondents about existing gun laws. All firearms are banned already for everyone under threat of prison unless they get temporary permission from the federal police after passing safety courses, background checks and reference checks. Trudeau is considering the total elimination of civilian gun ownership, Lorne Gunter said earlier today in a column in the Toronto Sun, without saying where he got the information. Graves, who retweeted the account of F*ck the NRA yesterday, was replying to Michael Cust in a thread started by TheGunBlog.ca sharing the Toronto Sun column. Cust, a Ph.D. student at York University in Toronto, had tweeted the article earlier. A coalition to disarm Canadians kicked off a new prohibition campaign this week. Graves said tonight that he wasn’t coordinating with anyone. If Graves’s guess is accurate and the Liberals win it could mean gun shops, gun clubs and hundreds of thousands of individuals in cities face extinction as firearm users. The guess by Graves shows gun owners lost support from a public bombarded by incomplete and distorted information from hostile politicians, press and pollsters. Trudeau tweeted in March that the law doesn’t require showing a firearm licence to buy a gun, omitting that buying, selling or having any firearm without a valid permit can lead to prison. The firearm community has also contributed to its own decline for decades with poor service to shooters and almost zero outreach to politicians, media and the public. While gun licences are at a record high, the percentage of gun owners in the total population keeps shrinking. “We as a community have done a really bad job in terms of communicating this is a legitimate, safe, common activity,” Nicolas Johnson, the editor of TheGunBlog.ca, told The Economist magazine in an article published this week. Many shooters vote Liberal or favour prohibitions and penalties on themselves and each other. Most keep their shooting activity hidden, leaving family, friends and colleagues unaware that more Canadian adults have a gun licence than play golf, hockey, soccer, or tennis. Clubs, even those that sit empty much of the time, are unwelcoming to new members and prevent them from bringing guests. With a few exceptions, clubs, stores and instructors avoid telling their members or clients about harmful policies such as bans, let alone how to oppose them. Some clubs refuse to have a website or to appear in directories or on Google maps. Canadian Gunnies saying a Liberal gun ban will never work: You're missing the point. The point isn't to ban, the point is to "appear" to ban. The Liberals are using PAL holders as a campaign tactic to win votes. Most gun businesses haven’t joined their industry group. Some 95 percent of individuals aren’t members of a gun-rights association. Most don’t subscribe to or support media including TheGunBlog.ca and Calibre magazine. 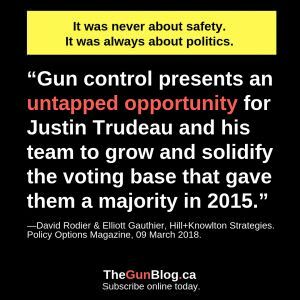 Many don’t vote at all or don’t support the only federal party standing up for gun owners today, the Conservatives led by Andrew Scheer. “The Liberals are putting their feelers out to see how much they can get away with banning for votes,” Cust said in a series of tweets in response to TheGunBlog.ca. “Just because hoplophobia — intolerance of gun-owners is popular — it doesn't make it right,” Cust said directly to Graves. The prime minister’s office and ministry of public safety, which manages firearm licensing, didn’t respond to a request for comment this evening from TheGunBlog.ca about the Toronto Sun article. The government is looking at handing more power to municipalities for firearms, a member of parliament said in September. Hill+Knowlton Strategies, a public-relations firm that advises the government, said in March that new restrictions on hunters and sport shooters present an “untapped opportunity” for the Liberals to strengthen their majority in parliament in the 2019 election. The PR company’s analysis was based on a survey that found almost 80 percent of Canadians don’t consider themselves knowledgeable about firearm laws. Roughly 2.2 million men and women have a temporary gun permit as a renewable five-year firearm Possession and Acquisition Licence. Millions more unlicensed family and friends of all ages also shoot safely and responsibly under supervision. Fewer than 29,000 people have signed a petition to the government to oppose bans and scrap Bill C-71, a draft law proposing new prohibitions, restrictions and penalties on hunters and sport shooters. Less than 5 percent of gun-licence holders signed a petition to the government to stop Bill C-71 earlier this year. Petitions are open to all Canadian citizens and residents, not only licence holders. Update Nov. 17, 11:20 Toronto time: The tweet, photographed last night and pictured below, appears to have been deleted this morning. The question didn't ask about handguns —it asked about ALL guns . Like most Canadians I could not care less about your point. The Ekos president responded later to Richard Rhodes about the ease with which poll results are manipulated. Update Nov. 19, 23:35 Toronto time: Graves blocked TheGunBlog.ca from viewing his tweets on Nov. 18. Nov. 18, 10:58 Toronto time: Adds that Graves deleted two tweets. Nov. 19, 22:22 Toronto time: Adds that Graves blocked TheGunBlog.ca on Twitter and deleted a third tweet.